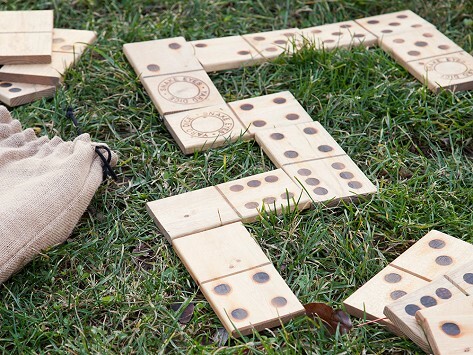 Snake Eyes Dominoes are Made in the USA with solid wood to last for years. A drawstring jute bag makes it easy to take with you so you can play fun and versatile yard games anywhere. Dimensions (each): 3.5" x 7" x 0.5"
Set Dimensions: 16" x 8" x 4"
Well made and packaged. Given as gift. Appears to be well made. Given as a housewarming gift. Well packaged. GREAT idea... fun for all! This game is a lot of fun and so easy to transport either just outside or to the park. Love the new spin on a classic game. Every birthday I've had the same situation finding a gift for my Dad who's physically younger than his age, but the synapses are not firing as they once used to. Growing up we were always an outdoor family - after opening and examining . . . and smelling . . . each of the dominos individually, he took Mom outside to play. 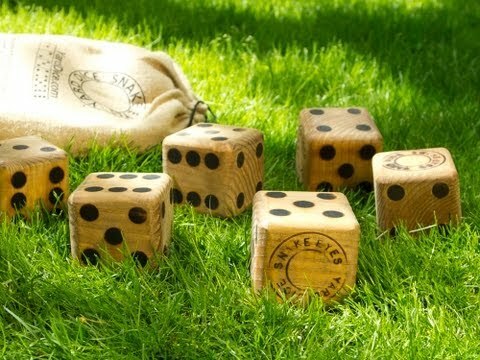 Jeremy’s hardwood dice are ready to roll anytime, anywhere. We’re feeling lucky. Are you?